Red mangroves, brown tanin water, peace and solitude are the rule here. 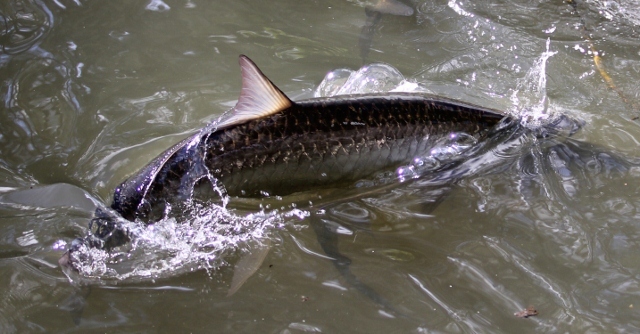 The snook can be found in many places: along oyster bars, on island edges, on the flats, near downed trees, or any place with current flow where bait will sweep through an ambush spot. One reason they hide is because of dolphin/porpoise predation. Needlefish, mangrove tree crabs, mullet and shrimp dominate the bait scene out-back. My favorite technique is to use a 10wt rod and a weedless monster bait fish pattern about 7” long like a striper bunker fly. Come to think of it they resemble a striper in many ways. Cast the fly into the roots and strip it out after it sinks near the bottom and be ready. Many of these snook are in the twenty pound range so the strike can be jolting. When poling the flats to sight fishing snook in the backcountry, find water that is 12” deep with small islands with deeper moats around them and use a mullet pattern on an 8 wt. Many east and west coast saltwater lakes exist like hells bay. As the tide goes out, some flats will dry on the low tide. Wait for the water to begin to fill the flat - then pole along, looking for fish cruising and foraging the flat and use that mullet pattern. Another fun presentation is to use a popper or Dahlberg type diver. It's explosive when a snook hammers a popper in the roots then either runs straight for the roots or hopefully comes out jumping. Poppers made of traditional deer hair create a “bubble trail” when popped and I really like them. I tie them on wide gap worm hooks with beefy weed guards in red and white with white bunny for a tail. Put cement on the face for durability. Leaders: 9ft, shock tippet 30-40lbs. 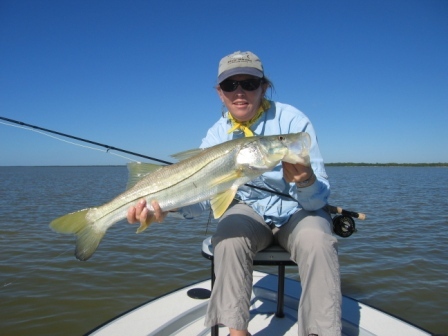 To Read about Fly Fishing for Snook in Florida Bay, click here.